As you’ll know, if you read this journal, I recently went down to Leeds for the weekend. The reason for my visit was the opening of the ‘Every Picture Tells a Story’ exhibition at Sunny Bank Mills in Farsley. I was exhibiting some of my new work alongside some other lovely talented folk including Emma White who runs The Jewellery Makers website. Emma kindly put me up for the weekend. She provided me with a really comfy bed to sleep in, she fed me lots of lovely food, plied me with wine and cheese and I had such an amazing relaxing weekend that I came home fully refreshed and very happy. 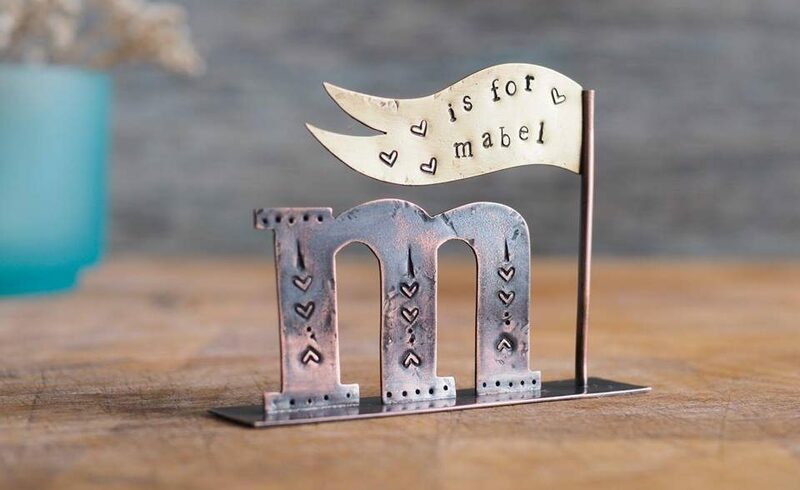 I decided to make her a gift and came up with a little personalised name banner for her baby girl Mabel from recycled copper and brass. I enjoyed making it so much that I listed it on my website in the hope that someone else would love it as much as I did and commission me to make some more. These personalised name banners would make a gorgeous accessory for any home and I’d be happy to take on bespoke orders/commissions and personalise them with the names or words of your choice. I was quickly commissioned to make two personalised name banners as Christmas gifts. 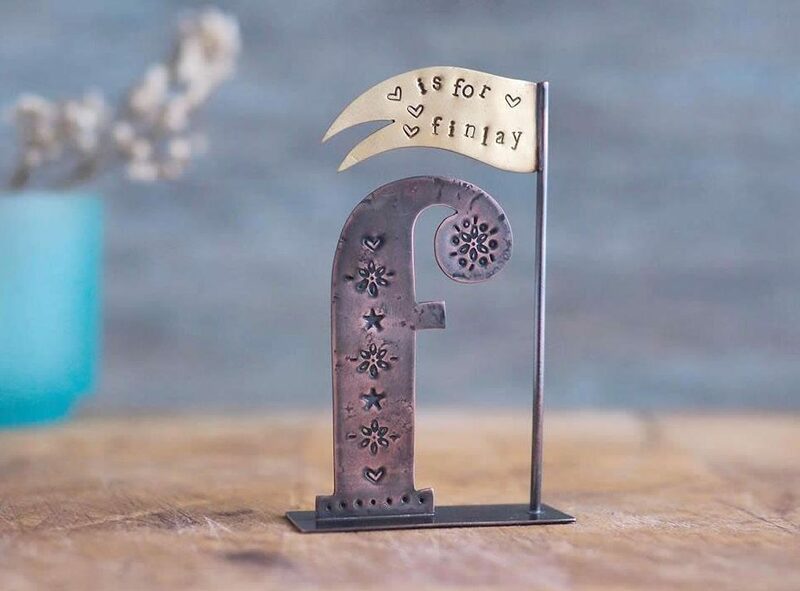 This time F is for Finlay and A is for Aimee. I bought these two banners as gifts for my grandchildren. They love them, and so do I! Evie’s designs are beautiful, original, quirky, and very well made. Her use of recycled materials (including her packaging) is a major bonus for environmentally-conscious customers. A name-banner would make a very special present for a new baby! 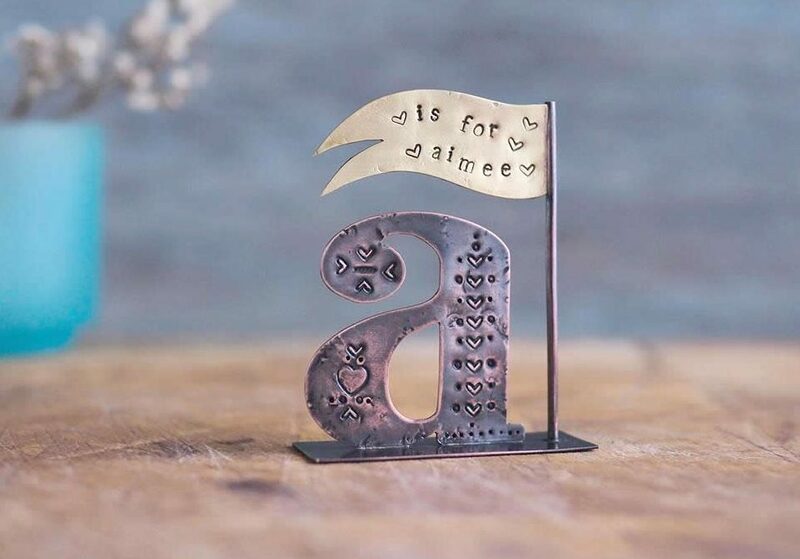 Very much like my individual copper type, each letter is handcut from recycled copper sheet using a fine jewellers piercing saw. I stamp the letters with decorative patterns and then solder them onto base plates that enable them to stand up independently. 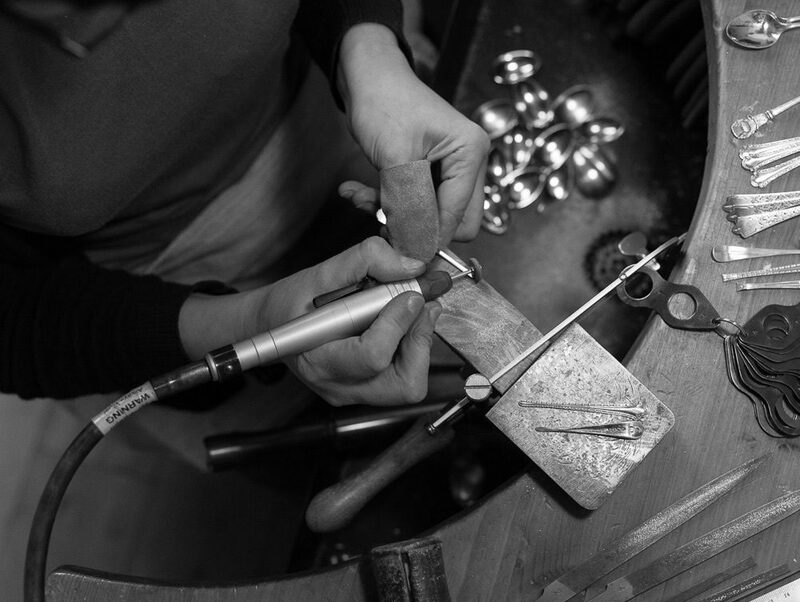 I stamp the brass banner elements, which are also handcut, with a font set that is 3mm high. Once finished I solder the brass banners onto lengths of copper tube which are then in turn soldered onto the copper bases. All letters are lowercase and measure bewteen 4-7cm high and the brass banners vary in size depending on the letter below them, but also on the length of the chosen name. They can feature hearts, stars and flowers or a mix of all three. I think they are one of my favourite makes now – so I’d love to make some more – HINT HINT! You could get banners made with the names of your loved ones, the names of your pets, maybe your favourite word or planet – I’m open to suggestions and happy to take on more commissions. A simple name banner like the ones pictured would set you back £48 and you can order them directly via my shop here, but if you would like something a little more bespoke, then get in touch and we can discuss the options. This entry was posted in Too Cute! and tagged Commissions, Copper Type, Personalised Name Banners, Recycled Brass, Recycled Copper.